It was a bit of a surprise to see Mark Warburton sub Gedion Zelalem out of the match in the 61st minute. At the half, the American had accounted for 29% of the controlled entries into the final third & was playing with a real zeal. However, the confidence began to wane with a few slack passes & the manager saw it as an opportune time to insert Dean Shiels into the fray. While Zelalem still did lead the team in CZE, it is interesting to note that the team’s success rate of 36% on those entries was the worst on the team. That’s not all on Zelalem, but rather his teammates were turning those entries into poor decisions & ultimately turnovers. Rangers only generated a shot on 9% of Zelalem’s CZE, but the other controlled entries into the attacking zone resulted in a shot 30% of the time. This is should function as a real entry point for further analysis by reviewing the film to see where the breakdowns were occurring or if there was something about Zelalem’s entries that were leading to those breakdowns. 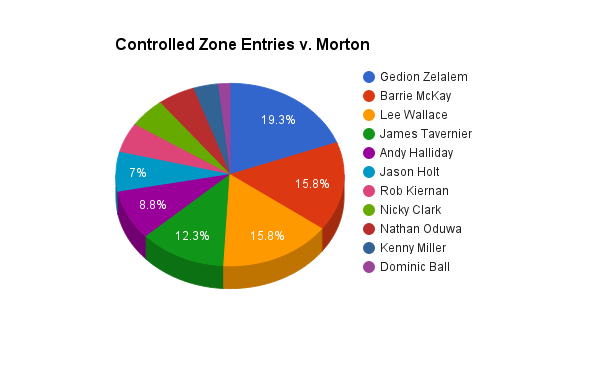 Barrie McKay bounced back from a sluggish few weeks when it pertains to CZE & was effectively driving possession against Morton – particularly in the first half. Of his nine CZE, eight came in the opening 45 minutes. This explains the need to replace McKay in the 73rd minute. Nathan Oduwa brought that directness, which McKay had lost, back into Rangers attack & it helped lead to Martyn Waghorn’s equalizer. A notable absence from this list is Martyn Waghorn. Waghorn was deployed out on the right for much of the match, even though there was a real fluidity to the team’s tactical approach – so his positioning did vary. Nonetheless, with Kenny Miller operating as the main striker, that push from the right was isolated to James Tavernier. This resulted in a bit of imbalance in how Rangers entered the final third. Of the CZE, 37% came from the players out on the left flank (Wallace, McKay, & Oduwa), 35% came from the central midfielders, & 13% came from Tavernier & Waghorn. As teams look to limit Tavernier’s impact on carrying the ball into the final third, it would be ideal to have a complimentary player on the right to keep defences a little more honest. When Wallace & McKay have that synergy it provides a real threat from the left wing as they effectively play off each other’s runs. It’s also a bit of a surprise to not see Dean Shiels have a CZE. His direct play usually has a tangible impact on Rangers attack…not so much on Saturday.